CLOSEOUT! 25% OFF. 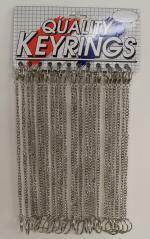 Our pocket chain measures 12" which includes a belt hook on one end and a 1 1/8" split ring on the other end. Product is available in nickel plate only. Packaging is 24/Card.